Tips and tools for wearing DAFOs. Instructions for how to put a DAFO on your child's foot. If possible, seat the patient with hip and knee flexed. 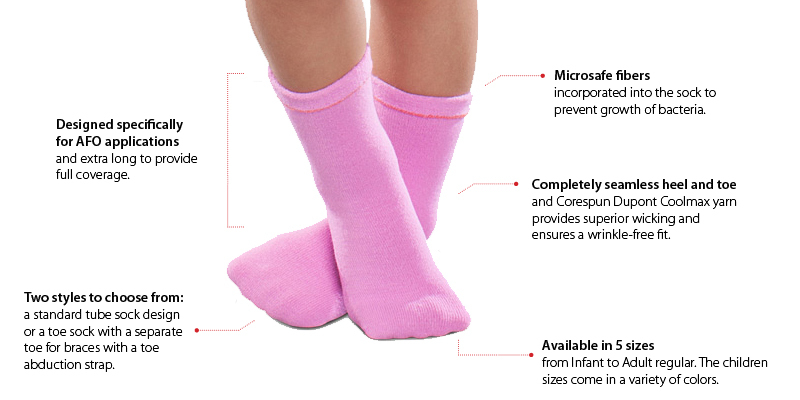 Place a suitable sock (a moderately thick cotton-synthetic blend is best) on the patient’s foot and smooth out sock wrinkles or bagginess. Open the top/front of the brace wide and scoop the foot into the brace. 2. 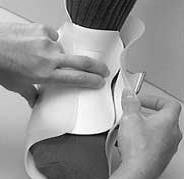 Work the heel in to the back of the brace. Pull the brace up and down slightly while pushing the top of the foot back. Note: It may help to rest the patient's foot on your knee. 3. Start the instep pad. Lift one side of the top/front opening and insert one side of the instep pad under the brace shell. 4. Close in the instep pad. Lift the other side of the brace’s top/front opening and insert the other side of the instep pad under the brace shell. 5. Settle the pad and foot. Massage the instep pad and the top of the brace to settle the pad down onto the foot and resettle the foot back into the brace. 6. Secure the ankle straps. Flex the ankle into slight DF by pushing up under the patient’s forefoot. Then tighten the ankle (instep) strap until snug. Secure the strap. 7. Secure the forefoot straps. 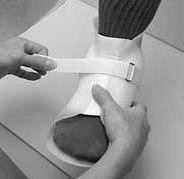 Compress the brace around the forefoot, then bring over the forefoot strap. Secure the strap. 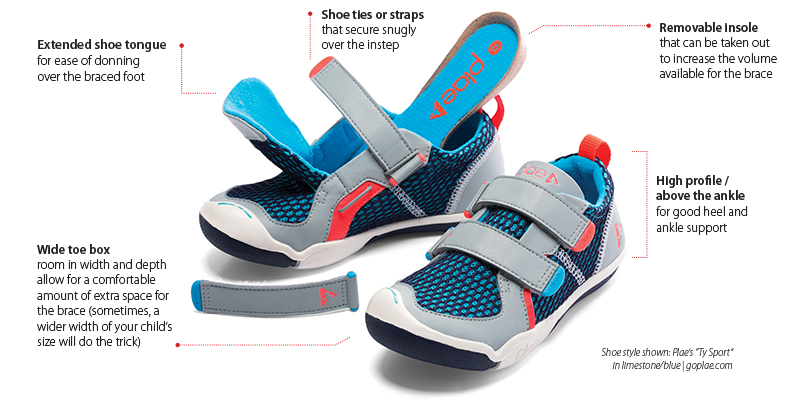 If your child’s foot moved while you were securing the straps, the brace may be too loose for optimal foot control. If so, release the straps and repeat steps 5-7. Cascade recommends an initial break-in period to allow time for the child to become accustomed to the brace and the foot to adjust. For new patients, initial wearing time should only be an hour or two. This will allow monitoring for problems. Check skin for areas of irritation and redness. Increase wearing time by one hour per day. The break-in period typically lasts two to three weeks. After this period, children are typically able to adapt to wearing braces full time. The break-in schedule may vary depending on the child’s level of involvement or past experience with bracing. The first week or two may be a time of less balance, fatigue, and irritability as the child adapts to the new foot position provided by the brace. Expect a learning curve as the patient acquires new balancing skills. Additional therapy time during the break-in period can be useful. Some skin redness, especially under the compression of the instep strap and pad, is common during the break-in period—any irritation should go away within twenty minutes of removing the brace. Complaints of discomfort, especially after the child has been wearing the brace comfortably for a while. Any red mark or irritation that does not go away within twenty minutes after removing the brace. Discontinue wear if redness or irritation does not go away. Function does not improve after a week of wearing. Cascade DAFOs are made from a variety of plastics, depending on the chosen brace style. They are thin and flexible, yet durable under normal wear. In cold temperatures, DAFOs may become brittle and more prone to stress fractures. Be careful not to suddenly pry the brace open when it is very cold. DAFOs should be worn with shoes. Without shoes, they are vulnerable to damage, they do not support the patient in the intended way, and there is a significant risk of slippage as the bottom of the plastic is slick. Clean the DAFOs using a sponge or soft brush with mild soap and warm water. Towel dry, then allow a few hours for thorough air drying. Do not dry with heat. Over time, when well worn, your child’s DAFOs may show signs of wear. If your DAFO is still effective but has distinct wear, arrange a follow-up visit with the clinician who ordered the brace. 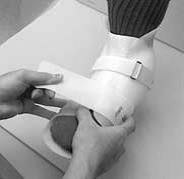 Refurbishments like replacing worn-out straps and padding and heating and trimming plastic can extend the useful wear time of the brace. All of our products are meant to be worn with socks and shoes. Here are some tips for choosing and using them. For more information, select from the links in the sidebar.